Refreshers – Strawberry Citrus and Orange Mango flavors being tested in Washington State. I really like the Refreshers. So far, my favorite has been the Cool Lime version that was tested in San Diego in July and August of 2010. The hallmark of the Refreshers lineup of beverages is that they include an unroasted green coffee in them. The flavor, in my humble opinion, is a little heavier than a tea but not quite a juice-type flavor. They’re light and refreshing. It’s clear that Starbucks wants to do something wonderful with this innovation. I’ve heard that these beverages were also briefly tested in a small area of Chicago too, but I never had enough information to turn that into a blog post. 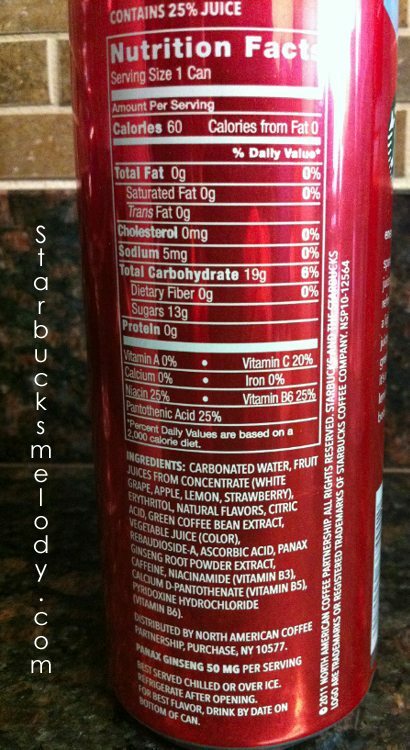 The new round of testing begins soon, and so here’s the early look: Arizona will be receiving a CPG version of the drink. (CPG stands for “consumer packaged goods” and it includes beverages that are ready to drink, and could be sold in a grocery store or in the refrigerated case at a Starbucks. The bottled Frappuccinos and canned Double Shot beverages are examples of CPG products.) I think that only Arizona gets the canned versions. A close look at the can makes it look like the CPG version of Refreshers is a flavor similar to a version I tried in Washington: Strawberry Citrus. The Strawberry Citrus drink that I tried previously did indeed have some lemonade-like flavor to it too, so it does sound like a similar drink to this canned “Strawberry Lemonade” Refresher. I don’t have any review of the Strawberry Lemonade canned product yet; I only have these photos but I wanted to share them. This won’t be the last time that I write about Refreshers. I have heard that starting on July 12, 2011, the Cool Lime flavor of Refreshers will be launching in Southern California. I am very excited about this. I might fly down and try the Cool Lime Refresher again. My final thought: I really hope the Refreshers do launch nationwide! I’d like to see the Very Berry and Cool Lime launch! Delicious! The pictures below come from a trusted source, so I wanted to share what the can looks like. As I mentioned above, for sure I will be writing about Refreshers at some point again in this blog. Please weigh in! Have you tried these? All new, mini bagel experience at 1500 Starbucks: Bantam Bagels. Starbucks re-tests the Tazo Iced Peach Green Tea! The Starbucks Truffle Mocha: Move Over Mocha Sauce! Sounds delightfully refreshing 🙂 LOVE to hear about test market stuff! @Gastarbucksgirl – Me too! @Donna – Wow! That sounds like another test product! Right now Starbucks is testing a number of things. I wish I could fly around and get to them all, but that’s not possible for lots of reasons! I know of tests in South Carolina, and Sacramento too. I might fly down to Sacramento soon. I can’t give too much away about that one. Donna, if you have any pics of the “Sangria” beverage at Starbucks or anything you’d want to share with me, I’d be forever thankful! Have to look if the Sangria is in my area. I tend to not like canned drinks, but in a rush it certainly would be good. I often wonder about all the ingredients in these drinks. I have tried the strawberry lemonade and orange melon; personally not a big fan but I am also spoiled having tried the barista prepared refreshers which launch in Arizona this Tuesday. I will be sending each flavor to you Melody to try, but I have to wait until they launch. Sorry! I forgot to say the promotional materials state that the rtd items will only be available in the Arizona market, but will be available at Target and a couple other select retailers. Arizona is also testing two flavors of refreshers cool lime and very berry hibiscus which are complete with real fruit pieces! Very exciting time for my market as we also will have the new iced caramel via, new iced coffee, and new bistro boxes(partner samples just came in yesterday and I hear they are delightful- I hate food allergies!). Love it! Our CPG team is amazing! These look awesome! I keep mentioning your “Refreshers” blog posts to customers almost daily as our topic at work as of late seems to be “Starbucks’ next big hit”. I can’t wait to try them! look ‘refreshing’ and interested in trying. am betting on preferring the lime for myself. very pretty can. don’t know if we’ll see them tho…..
but, if they show up around here, I will defintiely try them. Heaven! Sure hope they come up to Seattle, one would think so! Thanks for the heads up! Does anybody know how these drinks are made behind the bar? I’m really intrigued about how it all goes down. Either way, this is a really clever idea. It’s also potentially cheaper, since Starbucks doesn’t have to pay for roasting the beans for these drinks. I can’t wait to try it! We have a refresher fruit base just like the boxes of strawberry and orange mango. We use the tea shakers to measure to the first line(just like any iced tea), then water to the second line, add ice, add a scoop of blackberries or slices of lime, add the top and shake to perfection(must be shaken 10 times to rehydrate the freezedried fruit). Well, now you know why the coffee was taken off the new logo! They rolled out Trenta Refreshers in L.A…. I had a sample of the Lime flavor and it reminded of me of something from my childhood…. (menthol cigarettes?) I am still trying to figure it out, but it wasnt a pleasant taste memory! Then I argued with the Barista over the coffee content. I’m drinking a Very Berry as I type this. I live in San Diego and had one last year. I was sad to see that it wasn’t available anymore. I’m glad they brought them back and hopefully they’ll be a permanent item on the menu. @Donna if you love Tribute (and who didn’t?) I’d suggest Verona or Yukon. Not identical, but you will enjoy them. Very interesting to learn more about how the refreshers are made in cafes! When I saw the new promo weeks ago I was surprised to see (pleasantly!) that it showed refreshers for cafes who were testing it. I tried a sample of the Cool Lime Refresher this morning…I was not a fan. Maybe it was too early in the morning for it, so I didn’t need refreshed as much as I needed caffeinated at the time. I know they are made with green coffee but it really tasted kind of like tea to me. I will try the other flavors. I’m not really a big lime fan anyway…and maybe they’re still perfecting making them since the Refreshers are so new at that store. Hi Melody, I’m a bit late in reading this post, but I wanted to answer your question about Starbucks Vietnamese Iced Coffee. It’s not on the test item menu on the register, but it has long been one of those “off the menu” drinks that baristas have taught each other. In our market we actually get far more customer requests for this drink than say, tuxedo mochas or Cap’n Crunch frappuccinos. While nothing can beat the taste of authentic Vietnamese iced coffee, a Starbucks version that actually tastes pretty decent can be made: in an iced cup, shots of espresso are poured on top of white mocha syrup and swirled to mix; a scoop of ice is then added and the cup is either shaken or swirled to melt the ice; ice and cold filtered water keeps getting added this way until the cup is full. It’s notable for the sweet, creamy taste of white chocolate while maintaining the roasty caramel flavor of espresso – an excellent combination of bitter and sweet. Perfect pastry to go with it would absolutely be a cheese danish. It sounds like a white mocha americano, which we have tons of people ordering at all the stores I worked at. 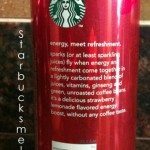 Starbucks Refreshers in the can are amazing! where can i get a case? where can i buy these starbucks refreshers? @Hamid – Try Safeway. I am hearing from a number of people that the canned Refreshers are showing up on grocery store shelves all over the US. One reader in Chicago mentioned that they’re there, and I saw a tweet about them being available in the West Seattle Safeway. They’re definitely in Arizona. Since they’re now showing up at grocery stores all over, I say go to your local Safeway, or Albertson, or QFC, or wherever it is that you grocery shop. Glad they are expanding. Maybe it is a sign of refreshers launching? There’s a new printable coupon on the Starbucks site for $1 off a can if you’re looking to buy it at the grocery/drug store. are these available nationwide now? @Tim – Let us know if you find these Refreshers in your local grocery store. Between twitter, and this blog, I’m hearing them popping up all over the place. They’re finally in Seattle now! They are advertising Raspberry Pomegranate, Strawverry Lemonade and Orange Melon n the Madison, WI market now. Have not tried one yet. 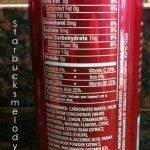 Went to the Starbuck website to see ingredients which they say are not available and to go to the vendor to check out the can.